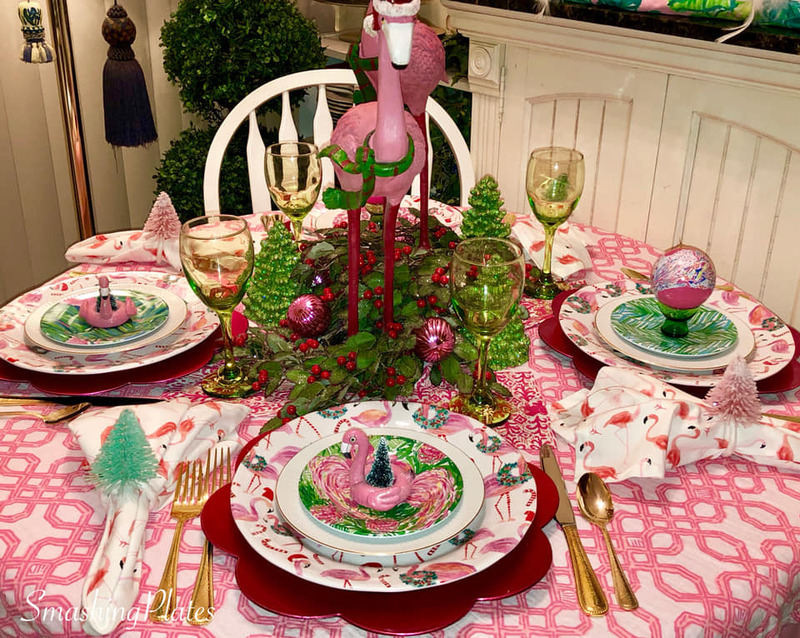 I thought I had set my last flamingo table at the end of Summer until I found this pair of pink beauties at HomeGoods a few weeks ago. I wasn't sure how I was going to use them for Christmas, but I brought them home in hopes they would inspire me. Well they did and I added a few new pieces to match along with some of my prized Lilly Pulitzer items that I have in my collection. 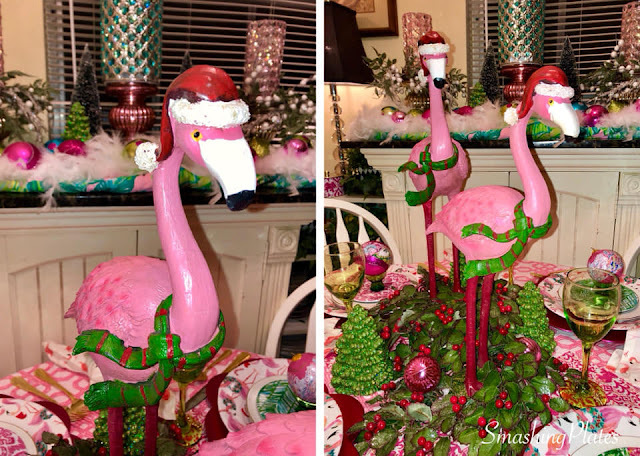 I love these Christmas flamingos. I purchased one in the beginning, but he looked so lonely I had to go back and pick up a mate. 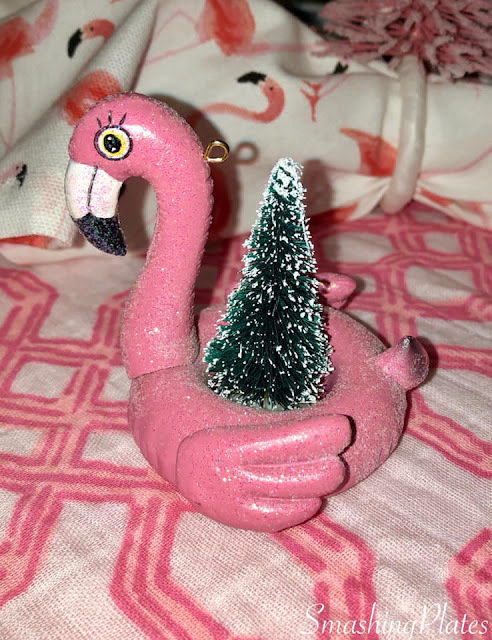 I found these cute flamingo inner tube ornaments at Pier1. I added the a small bottle brush tree to the center. My first thought was to use them as a napkin ring, but that didn't work. 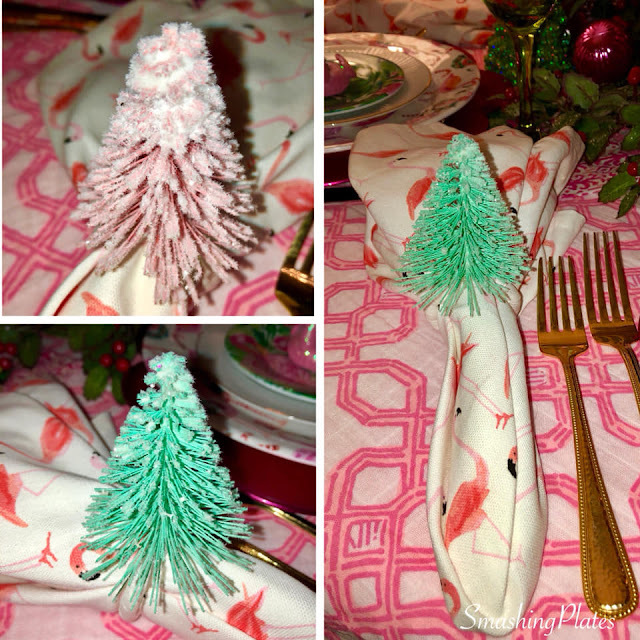 While I was at Pier1 I picked up the pastel colored bottle brush tree napkin rings. 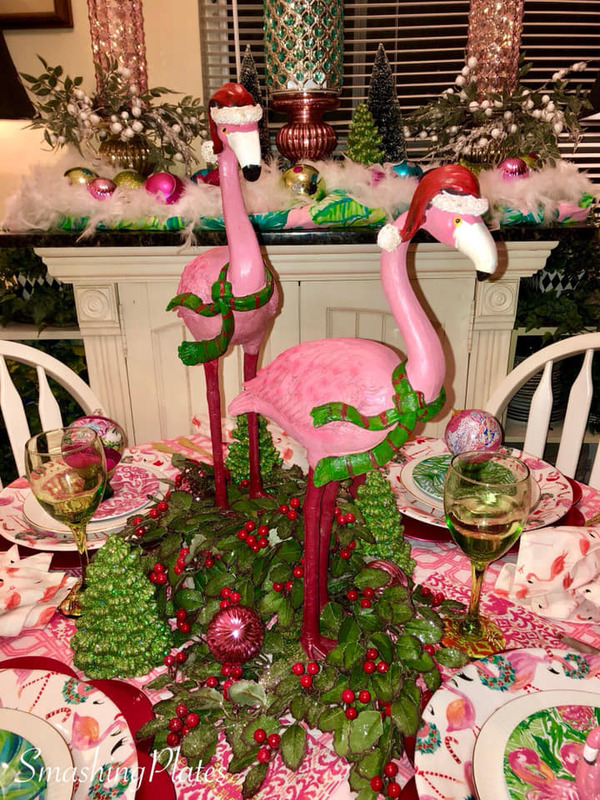 I added some silk holly with red berries candle rings to the base of the flamingos. I tucked a few pink Christmas ornaments inside the holly. 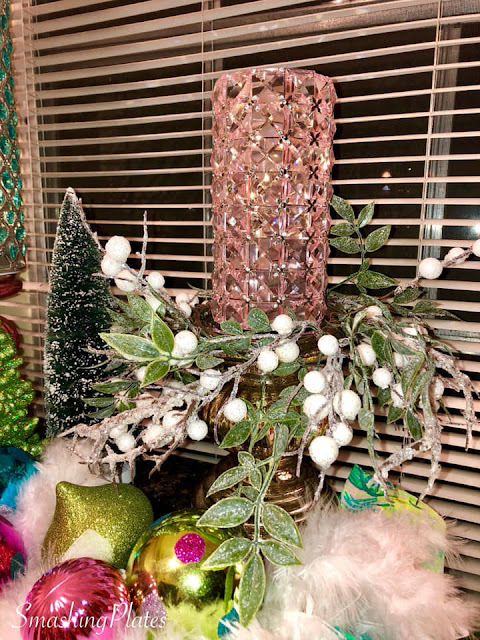 The green illuminated wax Christmas trees are from the Valerie Parr Hill collection. Here is a better look at the pastel bottle brush napkin rings found at Pier1. I used Kate Spade napkins. I used grass green wine goblets. 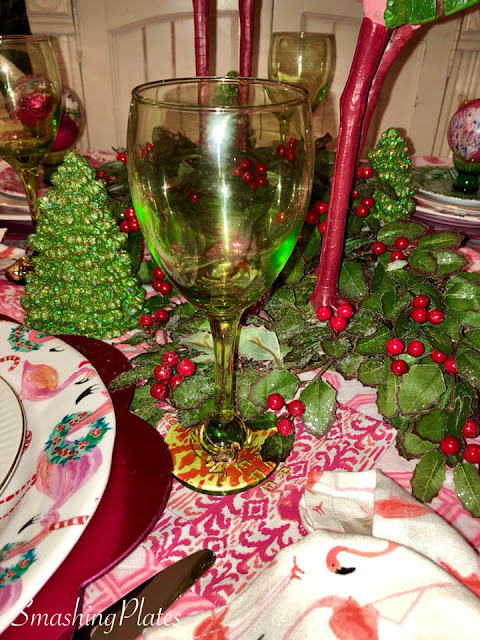 I placed a Lilly Pulitzer cotton napkin under each glass. This is the Tons of Fun print. 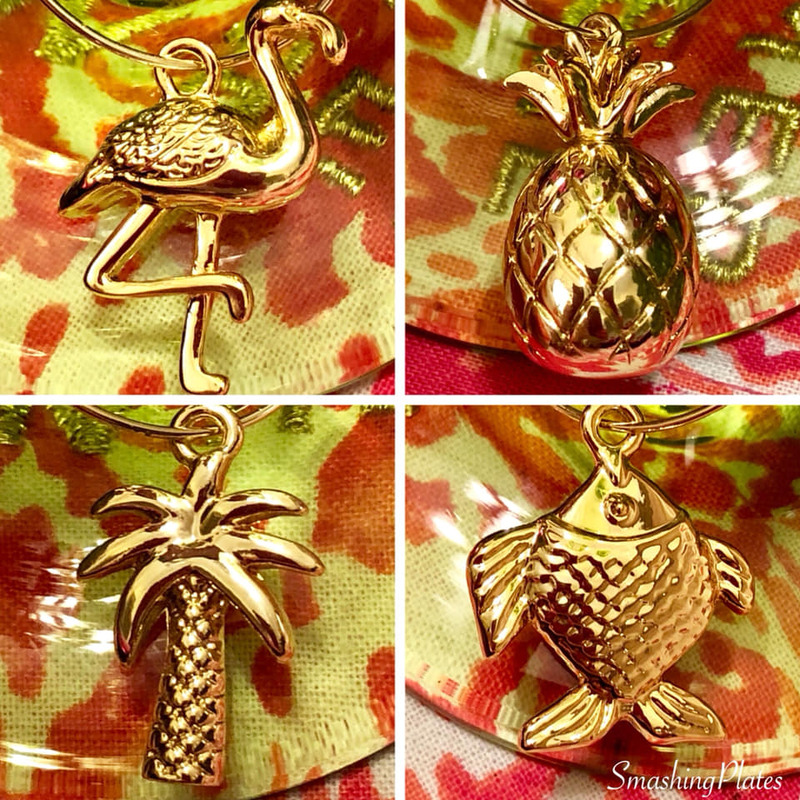 The Lilly Pulitzer wine charms are from earlier this year. Pottery Barn partnered with Lilly Pulitzer back in the Spring and offered so many pretty items. The print above is Well Connected Conch Pink. 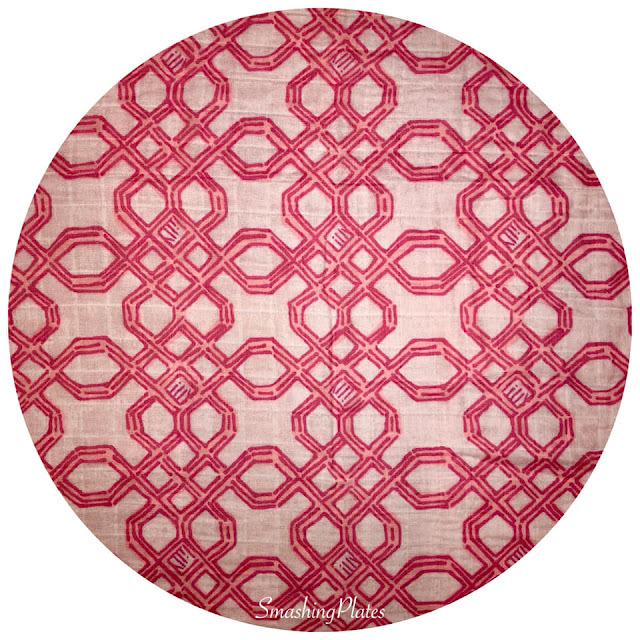 They used this print on beautiful occasional chairs and it was part of the Pottery Barn Kids Lilly Pulitzer muslin swaddle blankets. I have a small table and I knew the minute I saw the 47" square size they would be perfect for the table. I purchase the pink set and the blue set. They are currently on sale. 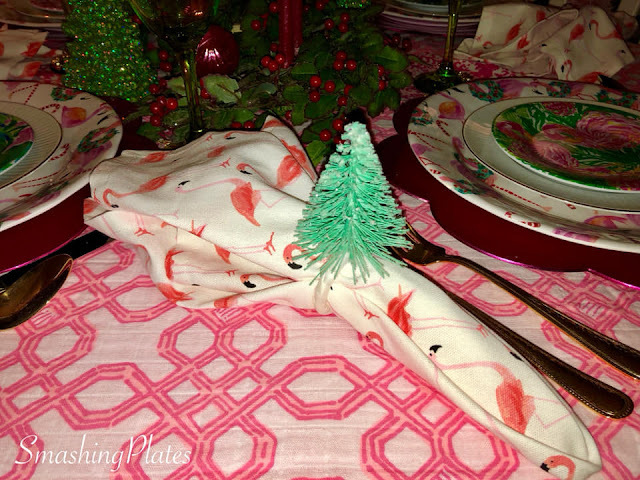 The table cloth is the Pottery Barn Kids Lilly Pultizer swaddle cloth collection mentioned above. 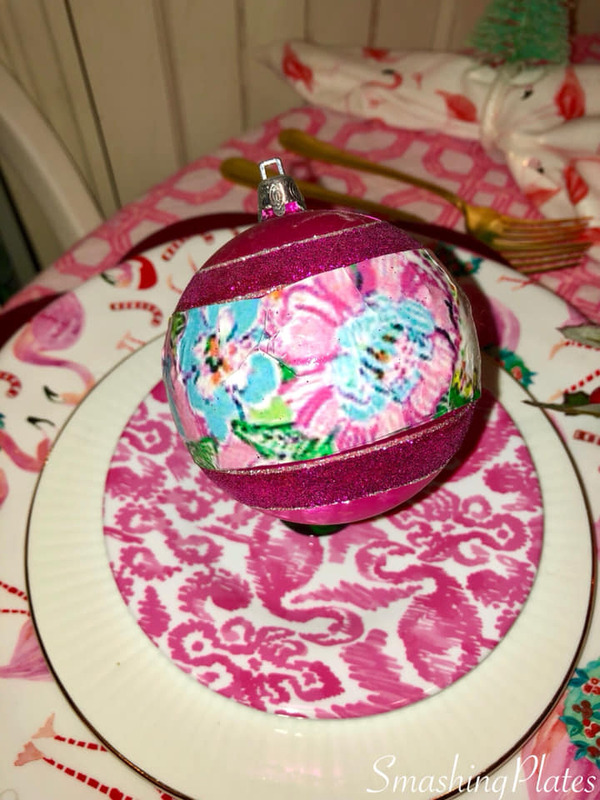 The hot pink flower shaped charger plate is from Michael's a few years ago. 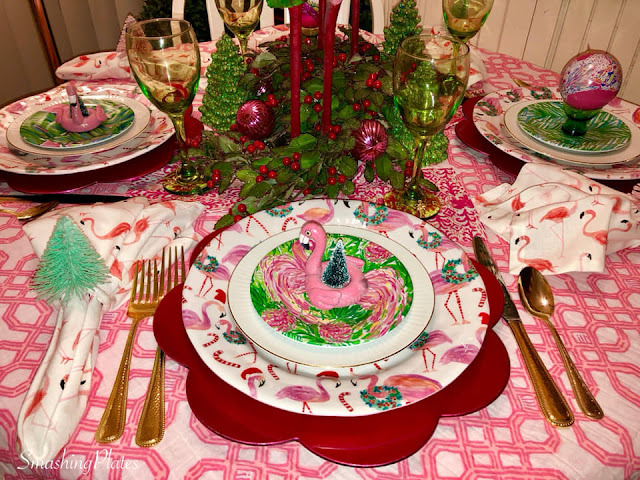 I found the pretty Christmas flamingo dinner plate at HomeGoods recently. They are by C&C California Home. The white with gold rim salad plate was a thrift store find. 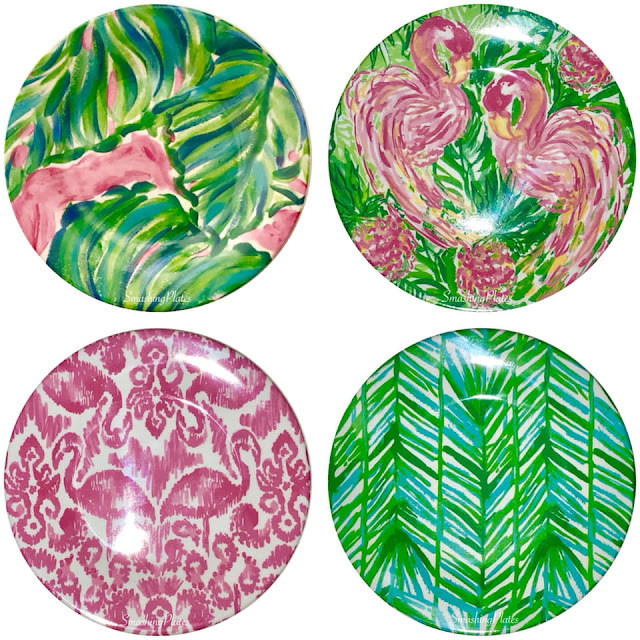 The appetizer plates are from Lilly Pulitzer. They are currently available on Amazon. They are in the Beach Bathers, Painted Palm and Costa Verdi prints. 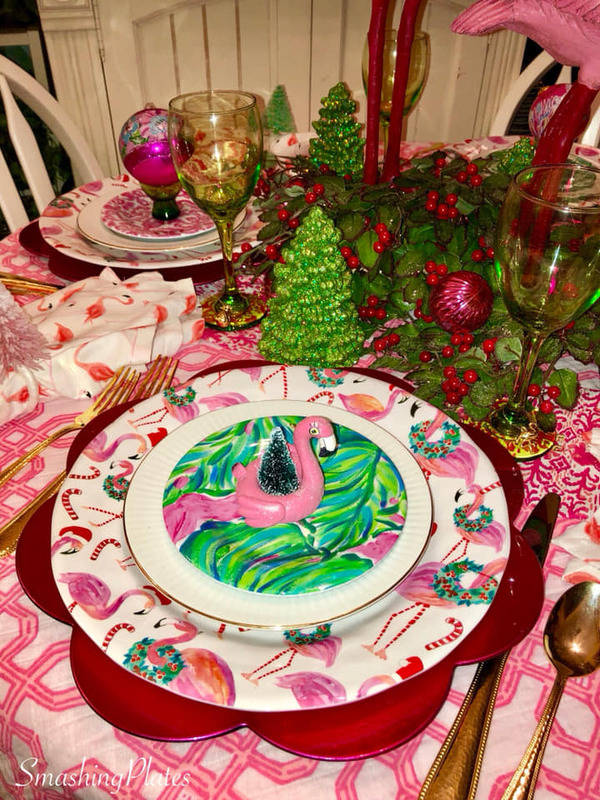 I'm still trying to find the print name of the plate with the pink flamingos and palm background. 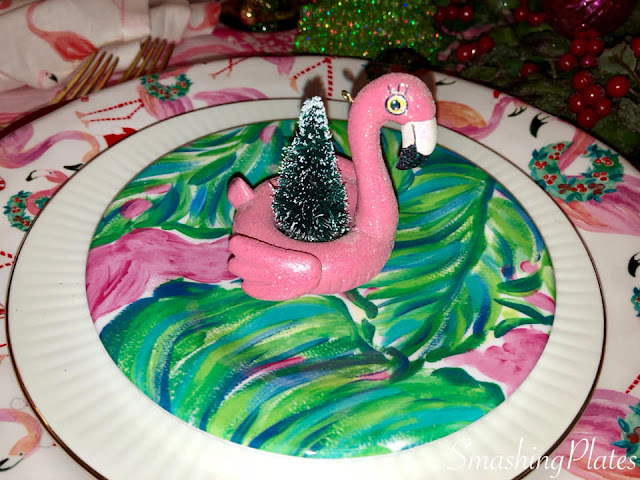 I love the little flamingo inner tube ornaments with the bottle brush trees. 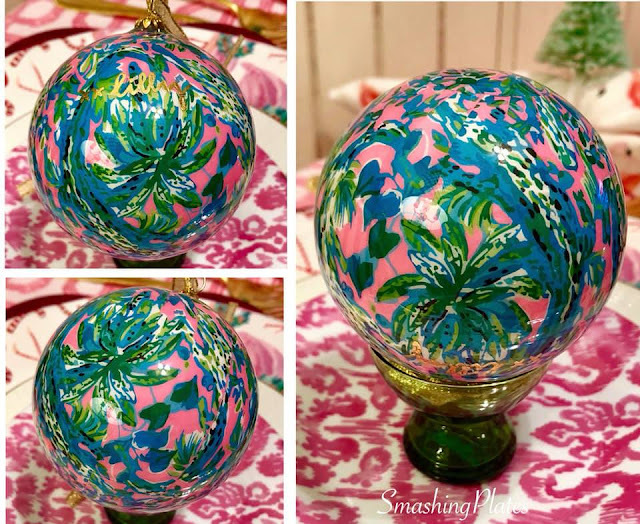 Lilly does a collectible Christmas ornament each years. This is the one form 2016. Somehow I missed the 2017 ornament. I made this one a couple years ago. 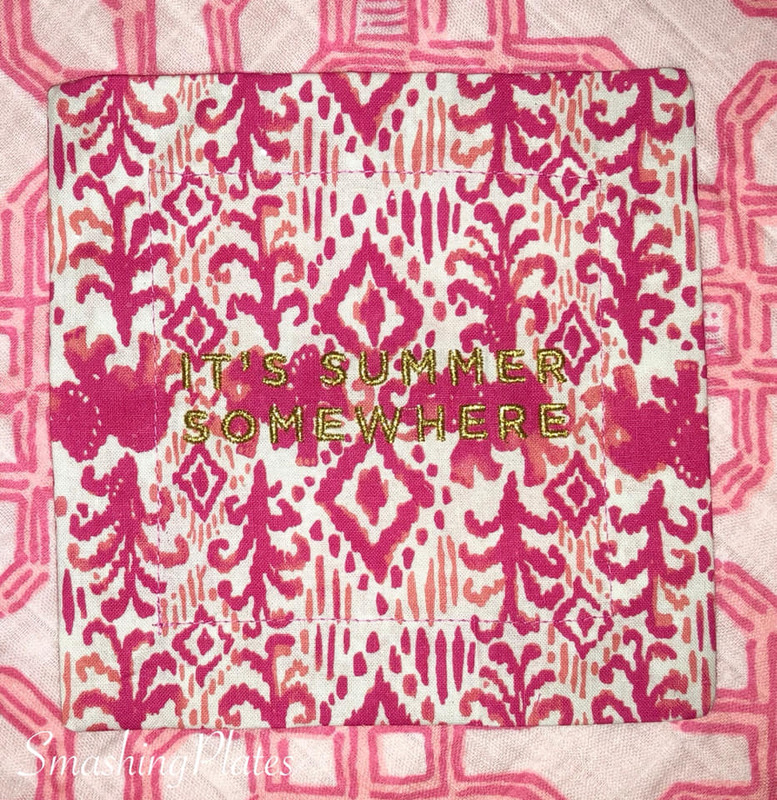 I used the Nosie Posey print that was part of the Lilly for Target Collection. 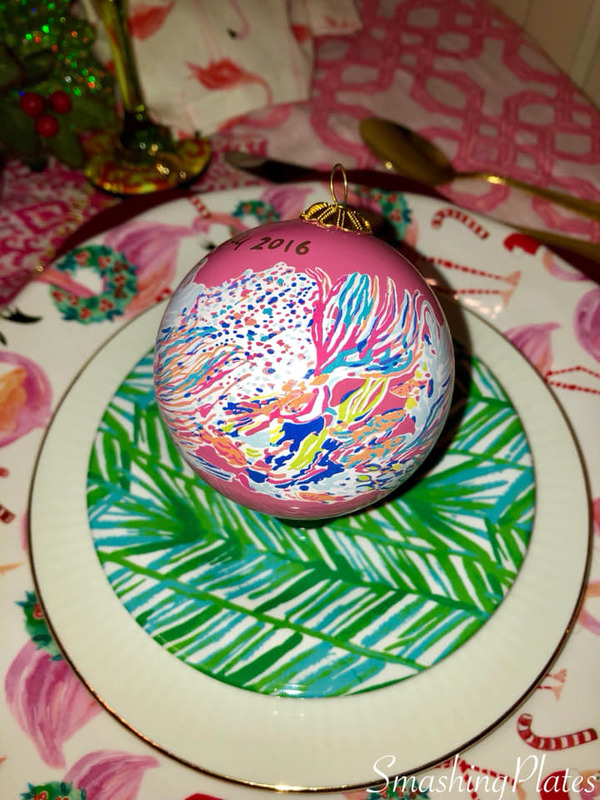 The 2018 Lilly ornament arrived today. It was part of a "gift with purchase" promotion on Cyber Monday if you purchased $75.00. I also used a Pottery Barn Kids Lilly Pulitzer swaddle cloth in the Local Flavor print on the server. I added a white feather boa on top and added a few pink, green and turquoise ornaments. The white glistening berry and leave candle rings are by Valerie Parr Hill. I used them with Valerie's pink illuminated faceted gem hurricanes with microlights. 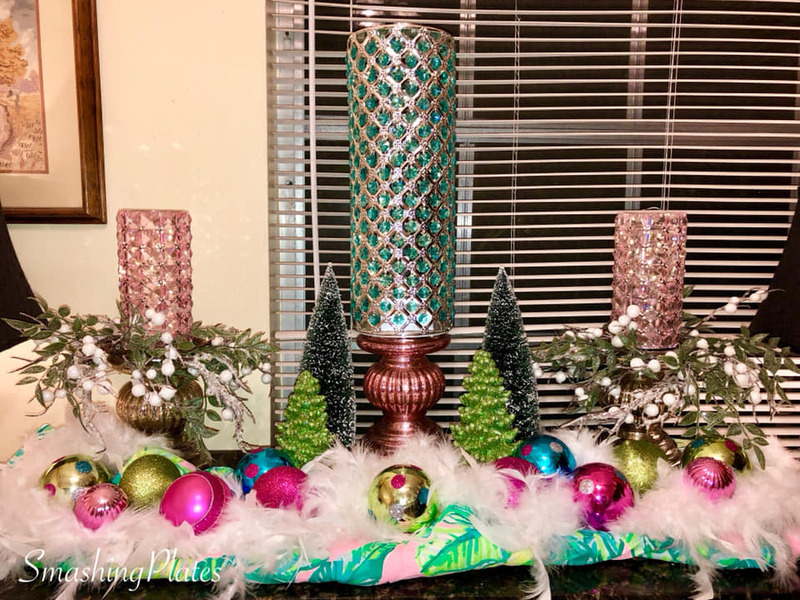 The candle holder is also from Valerie's collection. 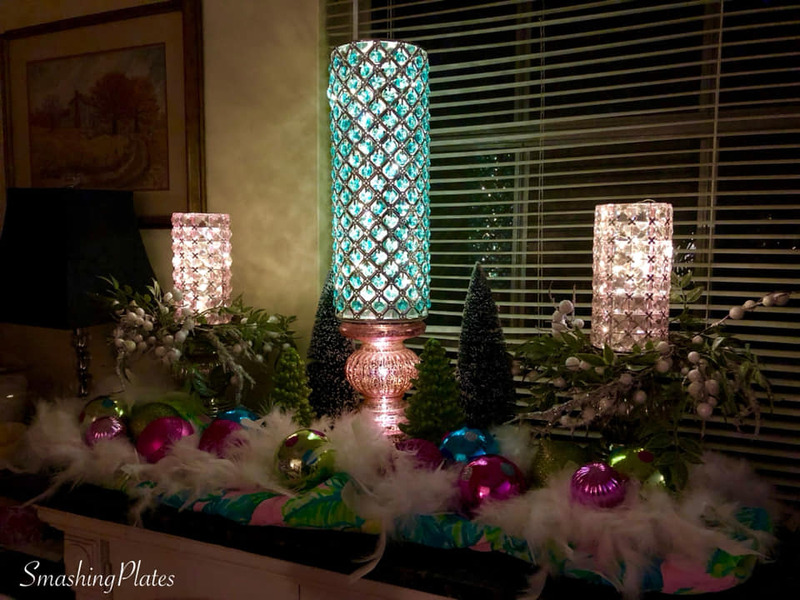 The illuminated pink candle holder and the 15" illuminated glass drop hurricane is also from Valerie's collection. This reminds me of cotton candy at night. It's so fluffy looking and the pastel colors are so pretty. 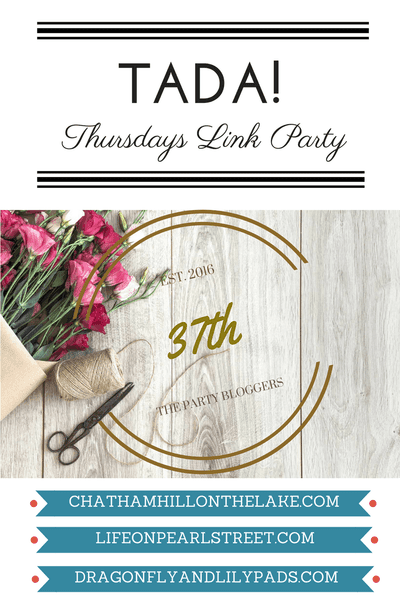 This post was featured on How Sweet the Sound "Anything Goes Pink Saturday". Stop over and visit Beverly's beautiful blog. Love all your flamingo plate stack and indeed it made a lovely Xmas tablescape. Pretty Xmas ornaments too and buffet dear friend. Thank you so much Fabby. Summer has returned to So. FL so the Christmas flamingos are happy. :) Thank you for stopping by for a visit. Merry Christmas to you too! Wow Catherine. I am loving your Christmas pink flamingos. Flamingos are so fun and cute. Those candle holders are gorgeous. 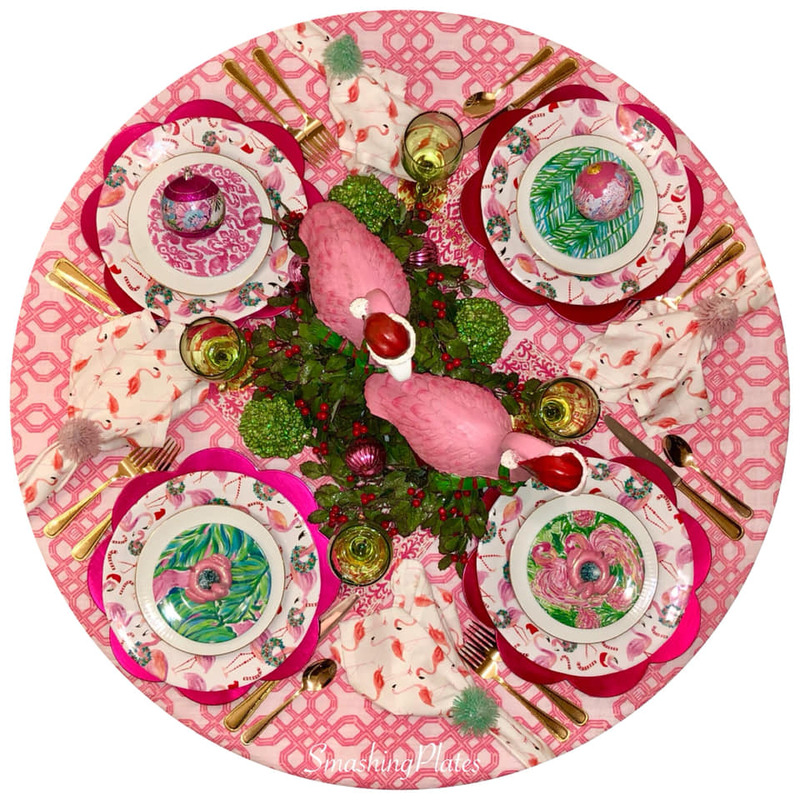 You have a great eye and I so appreciate looking at your tablescapes. Thank you so much Linda. I love flamingos and was so happy when I found these at HomeGoods a few weeks ago. 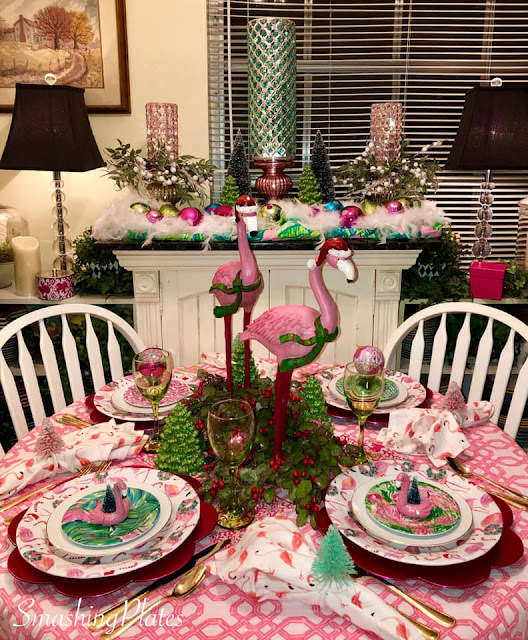 Oh, those Christmas flamingos are darling! 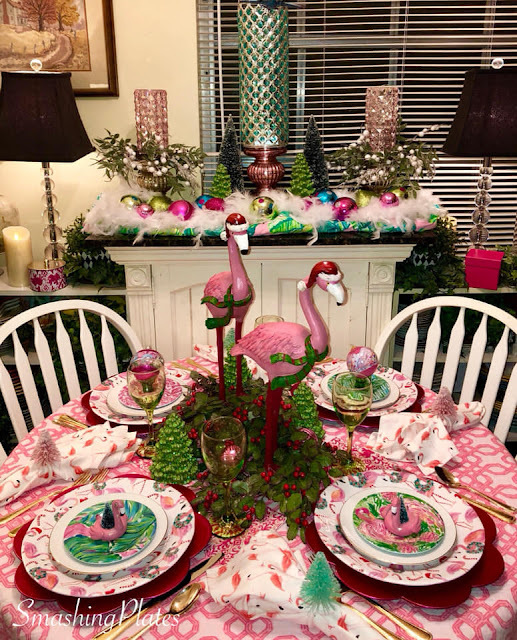 My granddaughter (who loves flamingos) would go crazy over this table. I'm in love with the plates, with the candy canes and wreaths along with the Christmas flamingos. When I get a chance to go to Home Goods I will cross my fingers that I can find some. 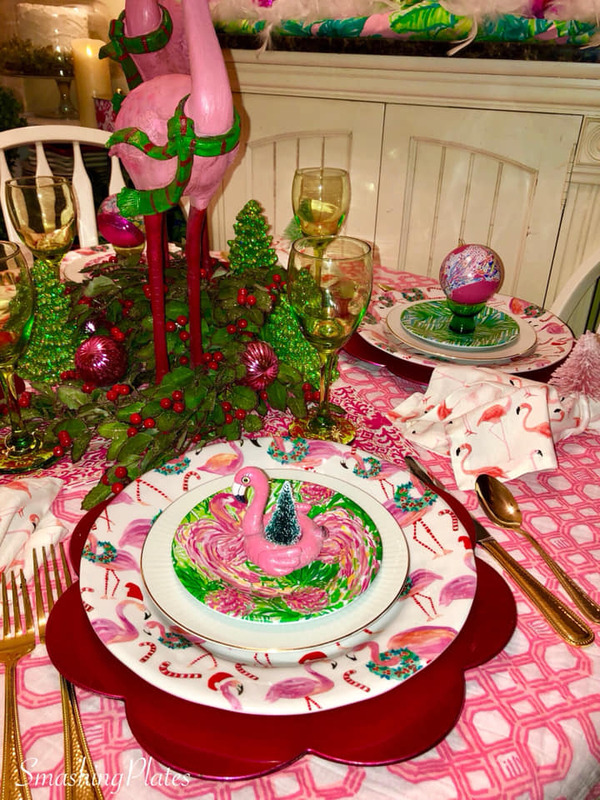 Another great table, fun and festive! Thank you so much Joy. 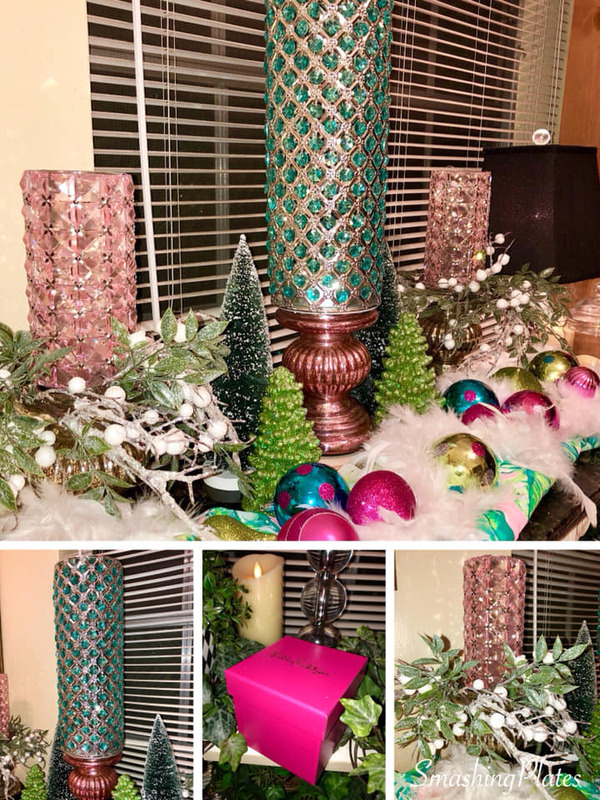 It was a fun table to start off the Christmas season. Hopefully your HomeGoods will have them in stock. I was fortunate to four at one of the larger HG's in Fort Lauderdale. 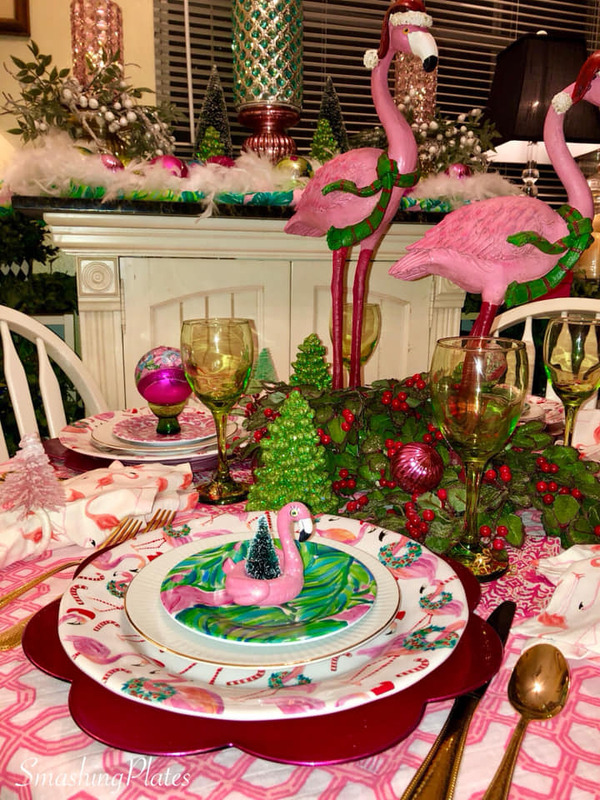 The one near my house had the two flamingos, but not the plates. I hope you can find the plates for your Granddaughter. 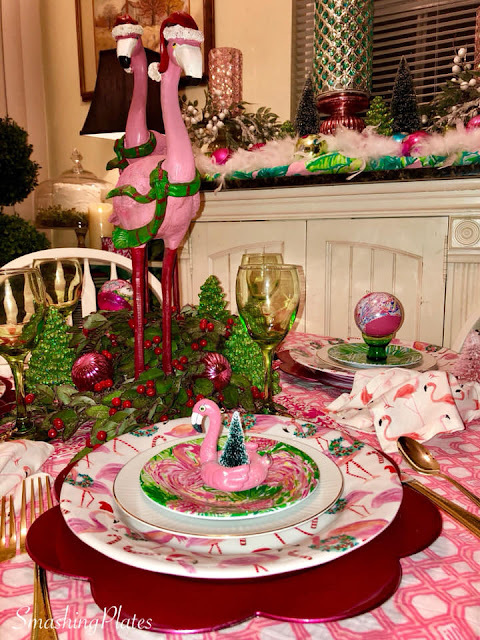 Oh Oh Oh I'm in love with this Flamingo Christmas Tablesetting. It's WONDERFUL. 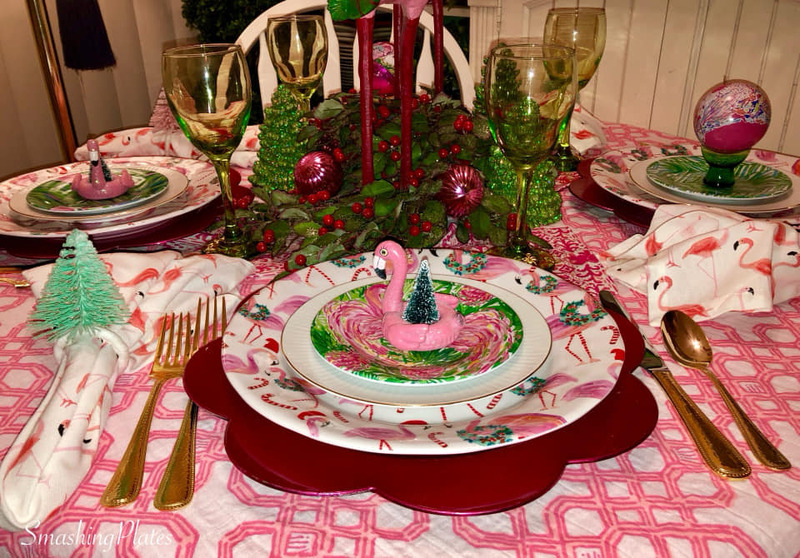 Yes I LOVE flamingos and I love those flamingo Christmas plates. Wish I had them. OOOOOOOOOO my. Aww, thank you so much Sandy. It was a fun table. This is so much fun!! I love love the Christmas flamingos and the plates, and so smart to pair them with LP! Thank you so much Jenna. 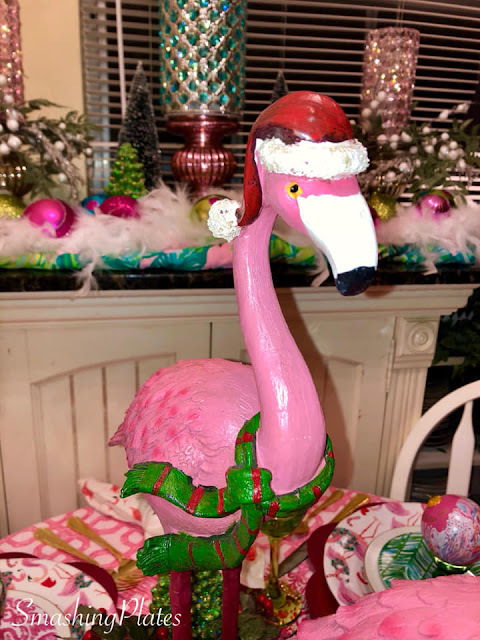 I'm happy I found the Christmas flamingos. 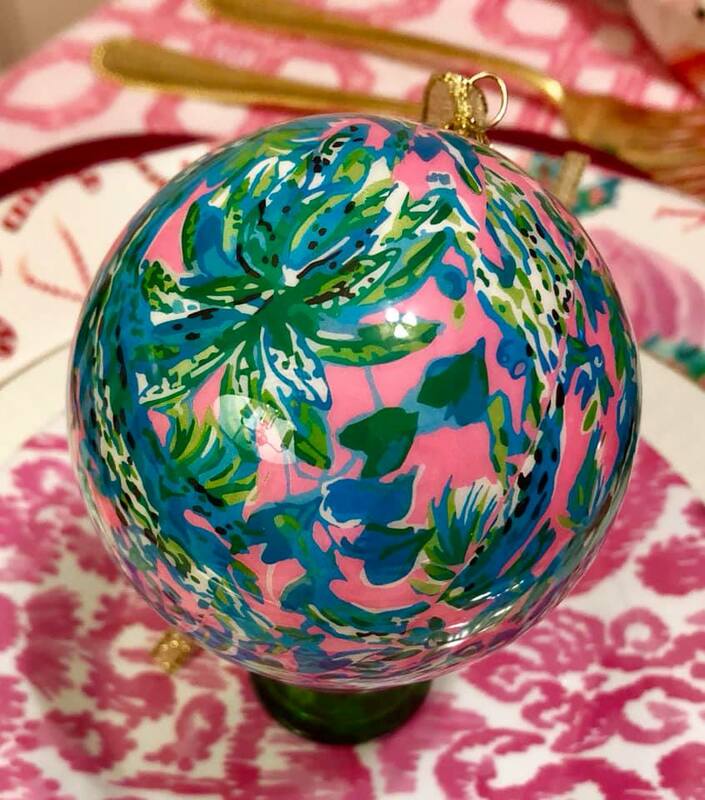 I was able to pull out the Lilly Pulitzer items one more time this year. Thank you so much Kippi! It's flamingo season year round here in Florida! Happy Holiday Season to you too! 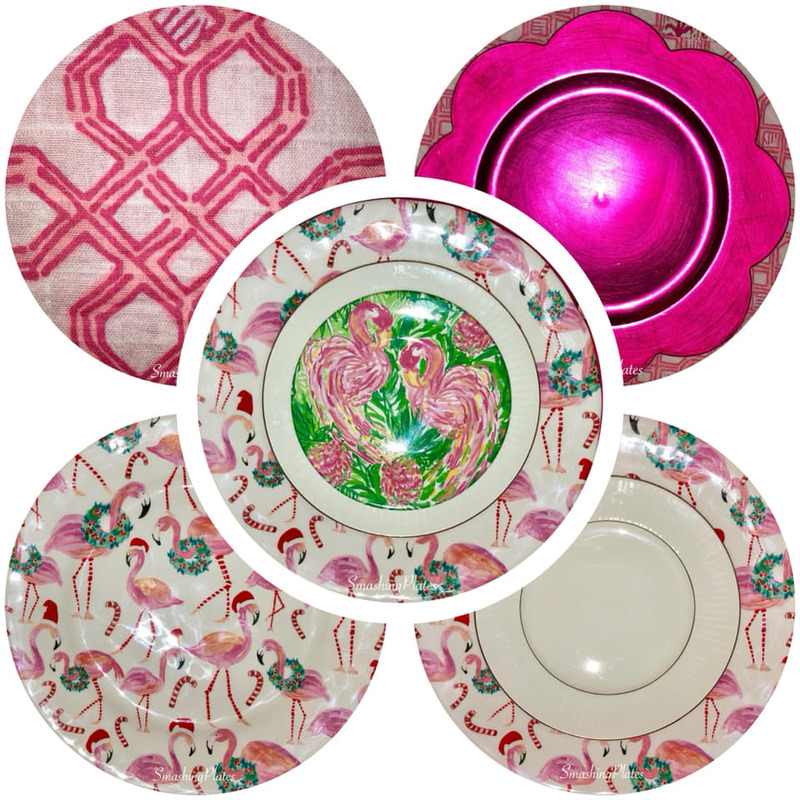 This post is being featured on my Pink Saturday post this week as "the one that caught my eye". 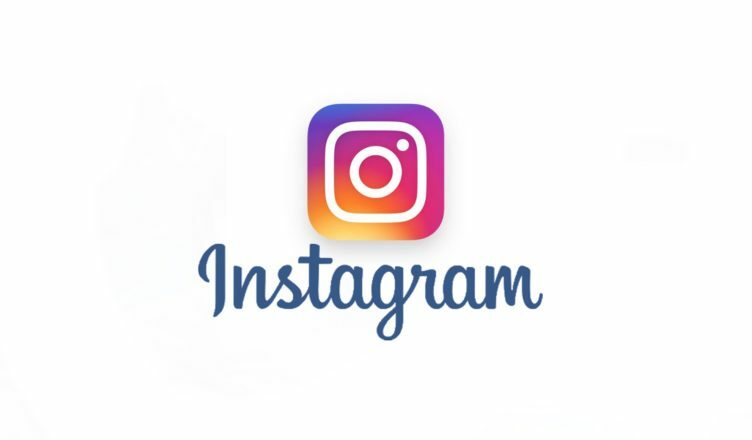 Thank you so much for the feature Beverly. What a great honor to be featured on Anything Goes Pink Saturday. Thank you! 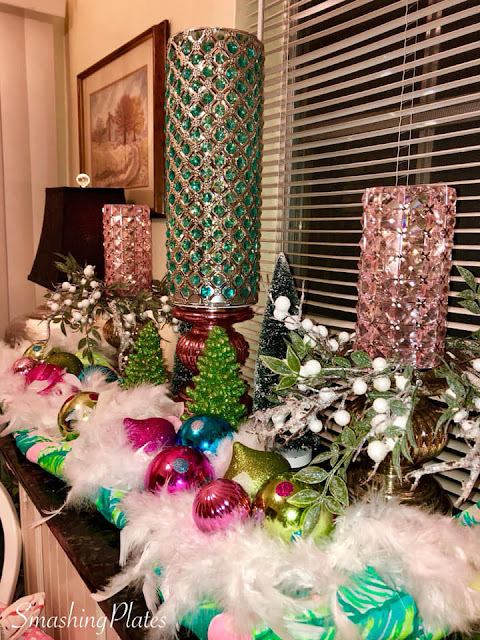 They are from Pier1 this season. I could not find them online to link in the post. Hopefully if you have a Pier1 nearby they will have them in store. 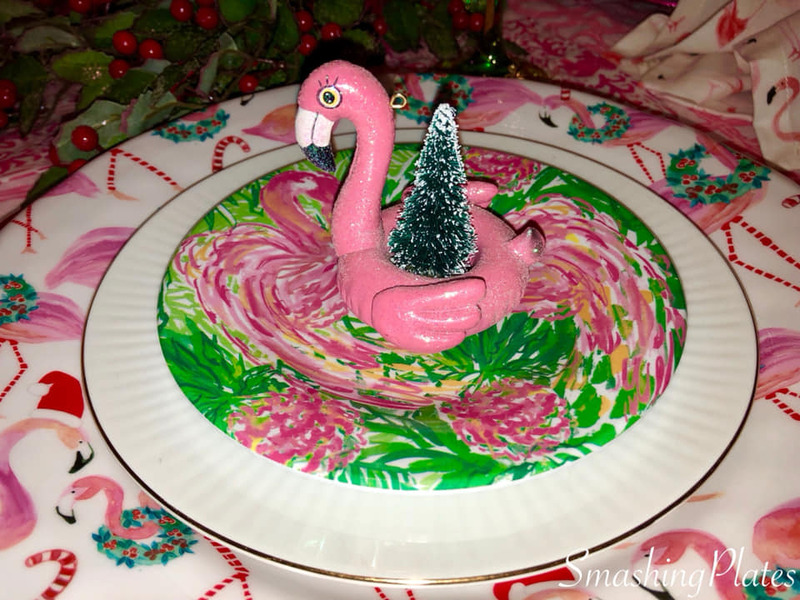 I really enjoyed your post; I am a flamingo lover, too! I confine my collection to the bathroom; my boyfriend collects penguins and I don't want them intermingling!! !